Maintenance Manager Everett Carroll and his crew based in Ashland are responsible for ten miles of the Siskiyou Pass on Interstate 5, ODOT’s highest priority in southern Oregon due to its importance as a regional freight route and high traffic volumes. The Ashland crew transitions its work schedule to provide 24-hour coverage during winter. 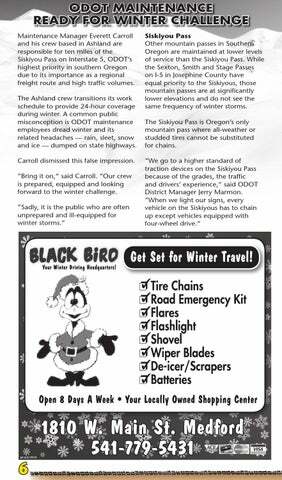 A common public misconception is ODOT maintenance employees dread winter and its related headaches — rain, sleet, snow and ice — dumped on state highways. Carroll dismissed this false impression. “Bring it on,” said Carroll. “Our crew is prepared, equipped and looking forward to the winter challenge. Other mountain passes in Southern Oregon are maintained at lower levels of service than the Siskiyou Pass. While the Sexton, Smith and Stage Passes on I-5 in Josephine County have equal priority to the Siskiyous, those mountain passes are at significantly lower elevations and do not see the same frequency of winter storms. The Siskiyou Pass is Oregon’s only mountain pass where all-weather or studded tires cannot be substituted for chains. I-5 travelers approaching the Siskiyou Pass can learn the latest road condition information by tuning their radio to the ODOT Highway Advisory Radio at 1660 AM. According to Marmon, the HAR signal broadcasts north to Central Point. Motorists are often caught ill-equipped to travel over the I-5 mountain pass. Winter storm-related delays and short-term closures are a common occurrence on the Siskiyou Pass. You need to prepare your vehicles to gear up for winter weather driving. For example, chain requirements on the Siskiyou Pass come with delays.